Dr. Hank Makini is a graduate of St. Louis High School. From 1979 to 1987, Dr. Makini attended Pacific University and Pacific University College of Optometry. While attending college he lived for eight years at the Forest Grove Fire Department's main station serving as a 'live-in' fire fighter. He received his B.S. degree in Visual Science in 1983. He earned his doctorate degree in optometry in 1987. His doctoral thesis was in Sports Vision. Returning to Hawaii after college, he began his optometric career as an associate on the leeward side of Oahu. In 1990, Dr. Makini began his private practice in the same coast area in the community of Nanakuli where at the same time began a screening program in conjunction with the local elementary schools for Chapter One readers. In 1995, the office was relocated to the great city of Kapolei, Hawaii where he currently lives with his wife, Sharon, and their three daughters, Ambrosia, Ariana and Alexis. Dr. Makini served the community as secretary on the Nanakuli Neighborhood Housing Board from 1992-94. He then served his profession as secretary on the Executive Board of the Hawaii Optometric Association from 1999-2000. In 2000, Dr. Makini had the opportunity to run for the office of Hawaii State Senate. From 2001 to 2003 he served his community serving on the Ewa Neighborhood Board. 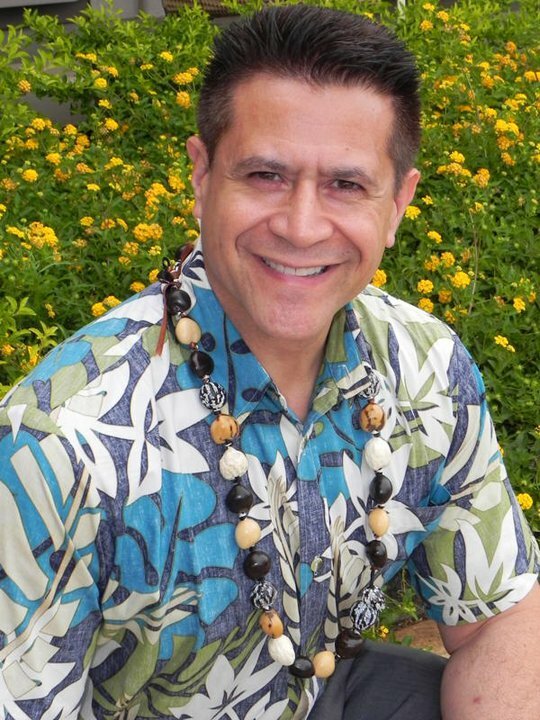 He served as a member on the Hawaii State Board of Examiners in Optometry from 2007-2011. From 2006-2014, Dr. Makini and his wife, Sharon, served as associate pastors at Christian Family Church in Kapolei and are now active members of The Jesus Church. Dr. Makini focuses much attention toward developing patient education and sharing with the public the critical importance of vision care in the lives of infants, elementary students, high school and college students, professionals, computer users, athletes and the elderly. His goal every single day is to make a difference in the quality of his patients' lives, one important life at a time. Dr. Makini enjoys spending quality time with his family, watching inspirational movies, doing home improvement projects, exercising, writing, and teaching. He gives all honor and glory to his Lord and Savior, Jesus Christ, for his life and the opportunity and ability to help people through the profession of Optometry. Greetings of Aloha, I'm Sharon Makini, the Manager of Operations and wife of Dr. Makini. My role is to ensure that your overall experience with our office is one that is most pleasurable, puts you at ease, addresses your questions or concerns and provides you with an assurance of quality eyecare. Whether you are a long-time patient or someone on the hunt for a caring, quality, eyecare professional, I look forward to welcoming you to our office! Dr. Makini, along with myself and the staff here at Eyes Plus, are a group of warm and wonderful individuals who collectively look to do everything possible to take great care of the visual needs of you and your entire family, all in a very comfortable setting while providing you with quality eyecare and the knowledge you seek about your vision, making your experience one that you will want to immediately share with others. The doctor has a great way with kids and helps to promote true "performance vision" which in turn helps the child's education statistics soar. His care extends to the need to bring awareness to the growing epidemic of the mistaken diagnosis of ADHD in our schools as well as helping all our keiki increase their visual experience, taking them to new heights by enhancing their academic performance through vision. Feel free to take advantage of our complimentary student academic vision evaluation and get your child on track to a better future! Stop on by and see our wide selection of quality eyewear as well as brands for contact lens options and more. We carry brands such as Oakley, RayBan, Maui Jim, Nike, Coach, Calvin Klein, Liu Jo, Nine West, Bebe, Guess, Harley Davidson, Swarovski, Adidas, Candies, Asian fit options, Color, Dailies, Monthly and Multi-focal contacts and much more! We are so blessed with the many great testimonies from a great many loyal patients, friends and family all due to the great care, variety of quality products and wonderful service they receive. I can say with assurance that once you are seen here, you won't feel the need to go anywhere else for your family's eye care! Once again, "WELCOME TO EYES PLUS", where we are family! 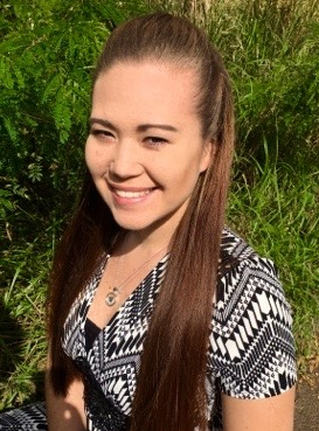 Aloha, my name is Ariana and I am the Assistant Office Manager here at Eyes Plus. I enjoy being able to make sure that every patient is serviced with the utmost care and are treated as our own ‘Ohana (familly). If there are any concerns administratively or otherwise, I'm most happy to assist in any way possible to help make your visit a great success. As the second eldest daughter of Dr. Makini, I consider it a privilege to be working alongside him, helping to create a genuinely friendly, family-oriented office for our patients to feel comfortable and confident in with each visit, year after year. I am a 2012 graduate of Kapolei High, a 2016 graduate of Shidler College of Business from UH Manoa with a B.B.A. in Human Resource Management and a second major in International Business. I've always had a real passion for helping people and a knack for business, so it seemed most fitting to combine them both with the honor to now be servicing you, our valued patients. Being the daughter of an Optometrist, I learned at an early age the importance of not only good eye health, but the value of being checked yearly to continue to be monitored for any visual changes that would affect my ability to perform well, both in and out of school. As an elementary student, my vision was normal, 20/20. It was not until junior high that I noticed the need to squint in order to clearly see the board, at which time, Dr. Makini prescribed glasses for me which helped tremendously. During my senior year in high school I became interested in contact lenses with all the benefits and conveniences it provided. I quickly learned there are a variety of contact lens brands in the marketplace and was very thankful that Dr. Makini found a very suitable brand of contacts that is just right for me. I love my AirOptix Dailies. My eyes feel nicely hydrated and I am able to wear my lenses longer without my eyes feeling fatigued, dry and irritated. I count it a blessing to be a part of the Eyes Plus team. It has allowed me to further develop and expand my skill-set on many levels to become the best at what I do, which in turn enables me to serve our patients with excellence. As I continue to observe our day-to-day operations and patient care protocols, I have gained an even greater appreciation and new found perspective on the importance of not only achieving and maintaining optimal visual health, but how our quality of life is greatly impacted in ways we can't even measure, especially when caught at a young age. 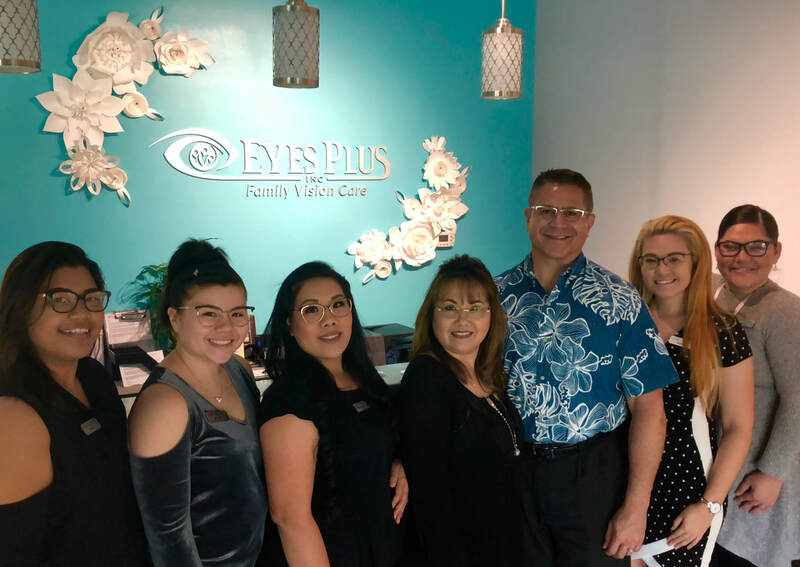 Please come on by and allow us to welcome you into the EPI ohana of quality eye health and vision care! Aloha, my name is Alexis and I am your Optometric Administrative Assistant. Being given the privilege of the designated person in charge of our great frame inventory, I look forward to providing you with a well stocked boutique, full of quality frames with many of the best name brands in the industry to make your selections from that are sure to keep you trending in the latest styles, comfort, and up-to-date technology of today. As a valued patient, one of my greatest joys is being a big part of your experience when you pick out your glasses and lenses that we design specifically for what your needs are, whether you work a lot outdoors, in an office setting or a combination of both, I look forward to assisting you with all of your important eyewear decisions! Being given the opportunity to work here at Eyes Plus is allowing me to expand my skills in a great many areas, such as patient and business communication and eye industry administration, all while gaining important knowledge about protecting the health of the eyes as well as helping to bring patients into the wonderful world of clear, quality vision by getting properly corrected visually. I strive to make an impact on people's lives and I definitely feel that I am doing my part working with Dr. Makini and the wonderful staff here at Eyes Plus. He has helped to alter my whole perspective on vision and how it has such a huge impact on how we live. Please come on by and allow us to welcome you into the EPI family of quality vision care for the whole ohana! Aloha! My name is Shantel and I am an Optometric Assistant here at Eyes Plus Inc. I joined the EPI Ohana in August 2016 and am loving every minute of learning and growing here. Helping people has been a passion of mine from a very young age and I, like most of our patients, love the "Ohana" atmosphere and warm “ALOHA” spirit that resounds in our office no matter the day. Being known as the “Glasses Gal” and Dr. Makini’s assistant, you will find me performing a variety of duties from assisting in the boutique, to checking-in patients, processing glasses orders, sending a friendly reminder about your annual exam or even taking your eye photos on our very cool, state-of-the-art, fundus machine, which provides us with the ability to fully examine the interior of your eyes and optic nerve for necessary monitoring of existing conditions as well as the benefits that early detection brings. I am a 2006 graduate of Pearl City High School, attended Leeward Community College and graduated from the Pacific Nurses Aide Training Center in 2010 in pursuit of my Nursing degree. I have had the great opportunity to experience working in multiple arenas within the medical field such as pediatrics and geriatrics until finding my home here at Eyes Plus, where I may be just beginning my optical health career journey, but am excited be able to apply my education and former experience to enhance the care of every patient we see here at EPI. I, myself, had to wear glasses from an earlier age to assist me with reading and currently wear contacts and glasses to provide optimal visual quality to keep me performing at my very best. I absolutely love the heart behind Eyes Plus Inc. and within my short time here to date, I have gained such a wealth of information about optical health and the importance of maintaining it. Dr. Makini takes the time with each and every one of his patients to ensure that they leave the office with a sense of peace and a wealth of understanding about their eye health. Our friendly staff is trained and properly equipped with recurring education about our products and services to ensure that our patients are well cared for and kept as our top priority! Aloha, my name is Tacy, and I am a Patient Care Assistant here at Eyes Plus Inc. I am the office's happy part-timer ready to help with any of your needs, from scheduling appointments and dispensing glasses to filing insurances and ordering contacts. So, if you have any questions on anything from what your insurance covers to when your glasses will be ready for pick up, feel free to ask me! I am currently a part-time student at Leeward Community College working my way towards a degree in elementary education. What attracted me to work for Eyes Plus was the passion that Dr. Makini has for children and their education, as I can see in his interactions with not only the children but also the parents and future parents. I am also a big supporter of his Project S.A.V.E. program, as it addresses the important issue of the impact that vision has on the future of a child through their education. Just like Dr. Makini, I want the chance to help children succeed not only in their education, but also their lives as a whole. I wear both contacts and glasses, with contacts on a more full-time basis. My Air Optix Hydraglyde monthly-wear contacts give me the ability to see clearly with great comfort. My glasses are made with polycarbonate material for superior safety, Transitions for protection from the sun and visual comfort for changing light conditions, and the most advanced anti-glare technology that allows me to give my eyes a break from my contacts and provide the same clear, sharp vision that everyone should have. I recommend Dr. Makini in caring for all of your visual needs because he not only protects the health of your eyes by his thorough annual exams and the education he provides to you on how to keep them healthy and visually sharp, but he and his friendly staff are eager and ready to take great care of the whole family! 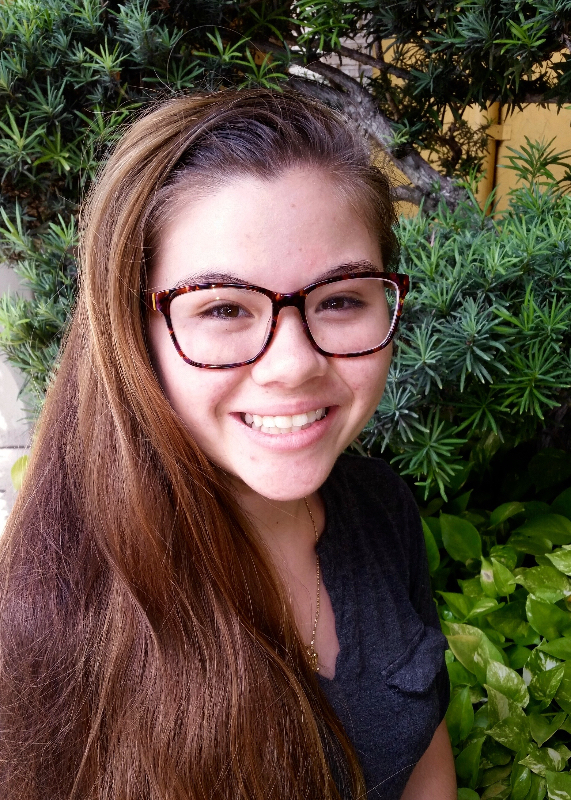 Aloha, my name is Brittanie, your Optometric Assistant here at Eyes Plus Inc. I joined the EPIC Ohana in 2018 and am truly enjoying my journey, where I’ve already gleaned such a wealth of knowledge within the fascinating field of Optometry. 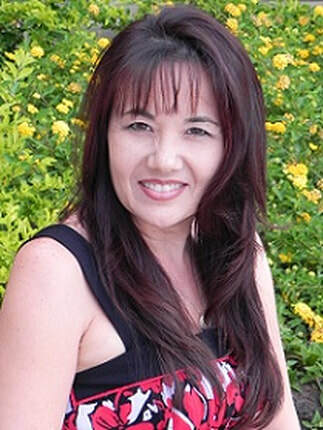 After graduating from Waianae High School in 2007, I attended Leeward Community College with a focus in Medical Terminology and graduated from Med-Assists School of Hawaii with a CMA Certificate to further my career in the Medical field. I bring to Eyes Plus former experiences that include working at both Saint Francis Hospital as well as Castle Medical Center (aka: Adventist Health Castle) as a Certified Medical Assistant. Helping people has always been a passion of mine and I’m thrilled to be a part of assisting others navigate the amazing world of their eye health and visual performance care. I can relate to the importance of seeing clearly, as it has played a significant role in my life from a very young age when I needed to wear glasses to help me focus better both in and out of school and now, well into adulthood. On a typical day, you will find me performing a variety of responsibilities such as assisting patients with processing through their diagnostic testing, helping with eyewear selections, to being that friendly voice on the other end of a call to not only schedule your annual eye exam, but also to remind you of your up-coming appointment or to let you know that your contacts or glasses are ready for pick-up, as well as many other aspects of care in-between. I am very excited that my career path brought me to Eyes Plus and as a past and present patient of Dr. Makini’s I know first hand that he and the staff are such wonderful, caring people and I am truly grateful and delighted to now be able to work alongside them. Dr. Makini is truly an amazing, knowledgeable and kind eye doctor that really does go “above and beyond” to make sure that all of our patients have a comfortable experience with a clear understanding of their visual performance and eye health, while working hard to ensure satisfaction with their results. If you are on the hunt for a great Optometrist and wonderful atmosphere with fantastic eyewear selections and a caring staff, please don’t hesitate to come and visit our friendly and helpful family-oriented office where I will look forward to welcoming you into the EPI family as well!